We can safely say that this was by no means as pretty or as fun as last week's outing. It was far too close for comfort, even when the numbers said Michigan was comfortably in control, well, we all know what those ESPN numbers can actually mean in the real world, but especially in this game. It was moments after the feeling that Michigan State's legendary luck, it's perma-horseshoe, was going to help them pull off another miracle was settling in when Shea Patterson got a super clean pocket, waited for a beat, then launched a beautiful arcing throw to a racing Donovan Peoples-Jones, who beat his man, slipped a last-gasp tackle attempt, and found paydirt for a 79 yard TD. DPJ then proceeded to pose like the Paul Bunyan Trophy and while the game was not over by a longshot, it felt much better for the remainder of the day, because Michigan's defense was not going to allow a weather-induced slopfest stop them from making Michigan State if not regret, then at least question several of their life choices on the offensive side of the ball. While a flag festival on MSU's final drive was enough to make a vexillologist convention happy, Michigan's relentless defense held Michigan State under 100 yards of total offense and won back Paul Bunyan and continued its revenge tour. 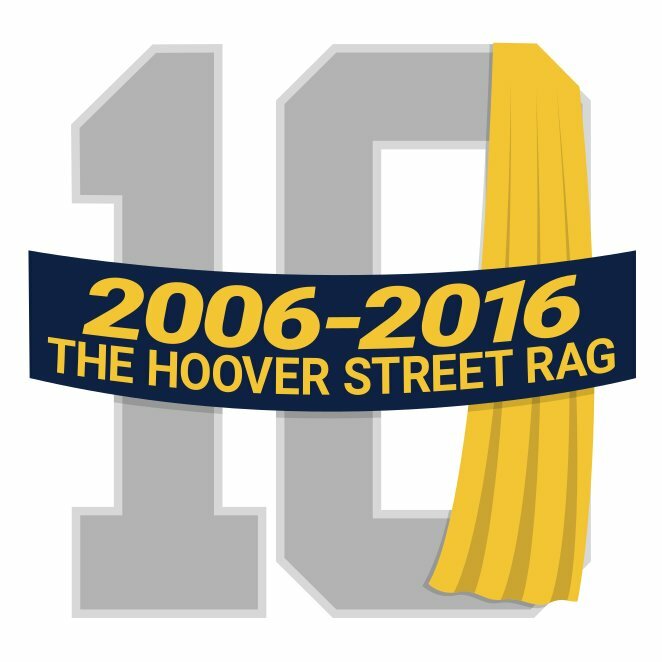 There will be people frustrated that Michigan has "lowered" itself to Michigan State's level, cries of "We're better than this!" and "Act like you've been there before!" In the past, I might have even agreed with this, but I realize now, Michigan needs to loathe Michigan State as much as Michigan State loathes them. They need to feel it deeply and completely, allowing it to permeate every membrane of their collective selves, seeping into every crack, and filling them with the same devotion to getting the job done. Michigan State has made a living off trick plays and luck that defies math for the last decade (seriously, Mark Dantonio may actually have assembled all of the pieces of the Weather Dominator, having successfully stolen them from GI Joe), Michigan could not afford to say "Ohio State is the only rival that matters" any longer. They understood it. They heard the narratives, 1-5 against rivals, haven't beat a ranked team on the road since 2006, they knew the world needed to erase those narratives and the only way that you can do that is to win this game. It was not a given. Even after taking the 7-0 lead on the longest TD drive in Michigan history (because of the weather delay, it took forever. Yes, this is a lame joke, we don't care.) 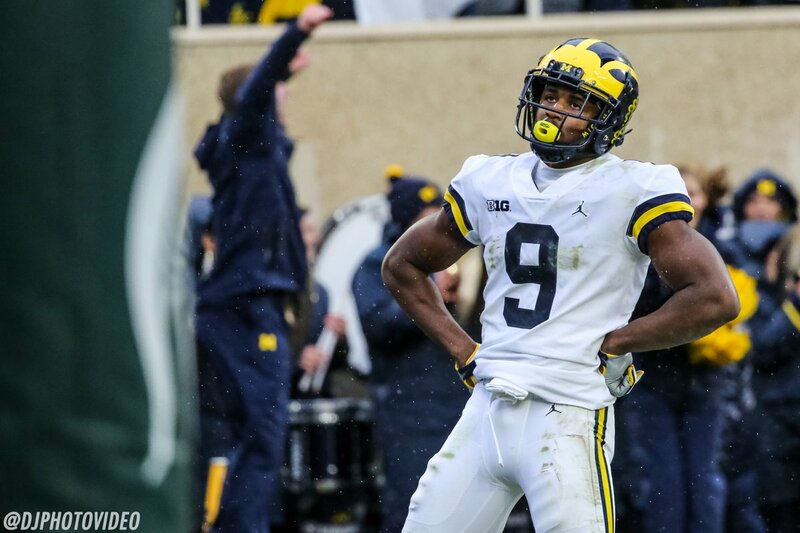 and just as Michigan's defense forced Lewerke into bad pass after bad pass, the inescapable feeling that Michigan had left points on the field, gifted with great field position and failing to cash in each and every time, including a disturbingly bad looking kick by Quinn Nordin, and headed into the locker room sitting on the 7-0 lead. Grumblings about conservative play calling, burning downs, and Shea's indecision swirled like the hot dog wrappers that tornadoed around Spartan Stadium during the weather delay. The rain returned, the strip fumble of Chris Evans inside the Michigan 10, and a trick play later, the 7-7 tie made it seem like all of those premonitions and predictions of doom were about to come true. So when the shot that people had been begging for all game paid off, when the running that had looked to be going nowhere had finally worn down the Spartan defense and was rewarded with a Ben Mason touchdown, it was a reminder of one indelible truth of football: Defense Travels. So Michigan enjoyed the win, their second in three years over the Spartans, Michigan Twitter maybe enjoyed it even more (OK, not as much as Chase Winovich) and Paul returned to his rightful home in Ann Arbor, and the joy of an open date coming off two straight big wins laid out ahead of the team and of us fans. Order has not yet been restored, but you can't start a winning streak without winning one. And I don't want to fall apart"
There exists a fine line between "making a point" and "trolling". Both were on display during the Michigan-Wisconsin game, Under the Lights VII at Michigan Stadium. "Making a Point" is when you have 25 or so Michigan offensive line alumni who were captains, all-Big Ten, or played five years in the NFL as your honorary captain, reminding Wisconsin, the conference's current farm-to-NFL table for offensive linemen that Michigan knew how to do that once upon a time and would like to do that again, preferably sooner rather than later. Trolling is when you play "Jump Around" late in the fourth quarter, leading some Wisconsin fans to laugh and shake their heads simultaneously. Either Special K has been summarily dismissed from the press box and replaced with someone who has a better understanding of what will get a Michigan Stadium crowd hyped, or he took some continuing education classes in that realm. For a change, Michigan didn't get off to a slow start (though there are those who would grouse about the missed Nordin field goal and worry that it was going to come back to bite Michigan later. When it was 13-7 at halftime, it was entirely plausible to construct scenarios in one's head on how the destruction was going to come to the strains of the MMB version of the Turtles' "Happy Together". I reminded myself, aloud, to the approbation of the good people of the upper levels of Section 7 that we got to halftime with a lead and Don Brown makes adjustments at halftime like whoa.) The fear remained persistent. Jonathan Thomas was being contained, but still getting 3, 4, 5, 7 yards despite multiple large men in navy blue shirts attempting to tackle him. 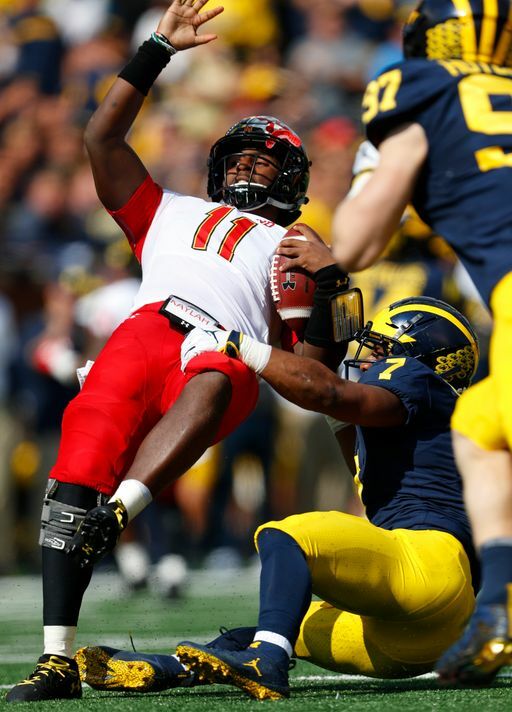 It was a tip your cap moment to both parties, Taylor's sheer power, and his shiftiness as a runner, the Michigan defense's assignment discipline (and overall discipline, just the one unsportsmanlike penalty after the game-sealing pick-six) that they were meeting Taylor where he was to prevent the chunk play. But slowly, the fears began to dissipate, like a fog burning off in the morning sun. The 75-yard drive, kept alive by the first roughing the snapper call I've ever seen in person (the Wisconsin fans near us were incredulous, they didn't even know it was a penalty. The fan near him said "We did, it should have been called in the 2015 Michigan State game.") and capped off by Shea's bootleg right where he puts the ball down in the end zone like it's a rugby try and the two-point conversion where I did not see Nico Collins at all until he had the ball in his hands. 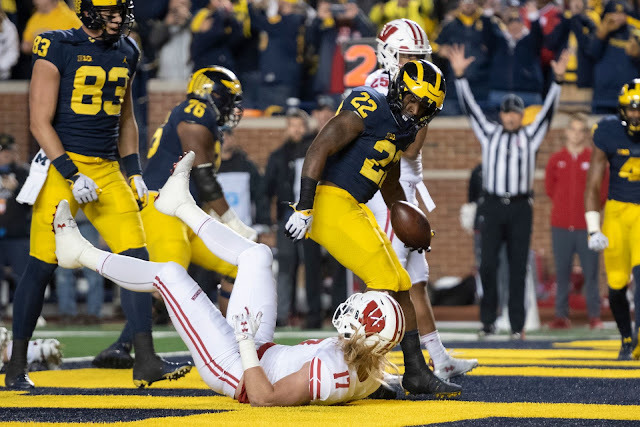 It began to feel like Michigan, with a two-score lead, on a team that had only mustered 25 passing yards on the night, might be on the way to changing the narrative about Michigan in big games. Then the Lavert Hill goes pick-six for a 21-yard ramble*, and a new narrative began to emerge from the ashes of the old one. It's not fully formed yet, it needs similar excellent performances in the next couple of games against Michigan State and Penn State to truly be a new argument, but this team is clicking. The offensive line, the source of much hand-wringing, has opened holes to allow Karan Higdon to run for 100 yards in five consecutive games. The much-maligned receiving corps has grown up, bracketed by tight ends who move the chains. This is not the Michigan team that looked like it would frustrate the hell out of the fans once more after the Notre Dame game. But this is college football, chaos can rear its head on any given weekend. Michigan avoided it with a statement win, but next weekend's chaos can loom as large if a team is not prepared for it. So the new week arrives. Beat State.